Bagels, undeniably, are one of the best grab-and-go foods for breakfast. While there are plenty of options for bagels across the state, not all of them offer the warm, oven-fresh fluffy goodness of these excellent bagel shops. You’ll love the heaping cream cheese, unique flavor, and fresh doughy texture of these Rhode Island gems. Who said New York had dibs on good bagels? Enter a Bagel Gourmet and you’ll feel transported to a real New York bagel shop. Though the storefronts of these Providence stores pose as unassuming, step in and the smell of fresh bagels and cream cheese will convince you. Try an everything bagel with chive cream cheese, or head to Bagel Gourmet Ole on Thayer for a more Mexican twist on classic bagels. With so many bagel options, you’ll have trouble making up your mind at Such a Bagel. 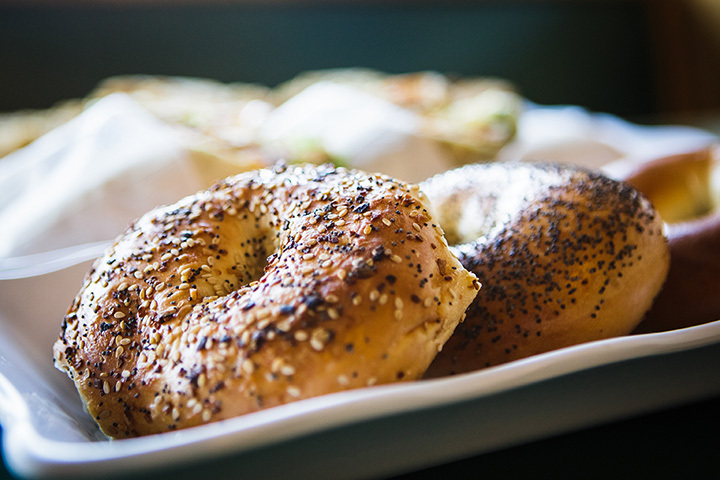 A favorite among Bryant University students, Such a Bagel bakes bagels fresh daily and offers a good selection of gluten-free varieties as well. Looking for a colorful bagel experience? Try one of Bagelz Bakery’s exclusive rainbow bagels—a vibrant breakfast choice to start off your morning right. Regulars love their flavored ice coffees, which perfectly complement a savory bagel, which Bagelz prepares to be perfectly dense and doughy. Though this bagel store is cash only, you won’t have to cough up too much—their bagels come inexpensive and delicious! Even better—they also now carry Ma’s donuts, a local favorite. Not a donut person but still looking for something sweet? Try a snickerdoodle iced coffee or vanilla chai with your bagels, too! This Mount Hope location boasts something that not many bagel shops have: A drive through. But try dining in—the interior of this recently opened bagel joint is full of large windows and gives off an artistic, modern feel you’ll appreciate while munching on one of their creative bagel flavors. With outgoing staff and a perfectly clean location, this is Bristol’s top spot to grab a bagel. This family-owned store bakes bagels fresh daily—try the cranberry walnut bagel with cream cheese if you’re looking for something sweet, or a multigrain bagel with homemade veggie cream cheese if you’re looking for something more savory. This small bagel store always seems to be buzzing! A true hidden gem in Providence, Bagel Express offers incredible onion, everything and sesame bagels. A fan of cream cheese? You’ll love the heaping portions they add to any bagel. Since 1989, Bagels Etc. has been selling their delicious bagels as well as salads and wraps. Order online or from their cozy storefront near the coastline. Make sure to try one of their bagel sandwiches too, which use Boar’s Head meats and cheeses. With coffee and bagels consistently delicious, My Favorite Muffin & Bagel Café is a sure breakfast hit. Try the Western Bagel Sandwich for a local favorite. If you’re in the mood for sweets, try a delicious muffin—they’re so huge and delicious that they practically verge on being cupcakes! While not uniquely a bagel store, this unique and hipster coffee spot on Providence’s West side serves some of the best bagels around—a perfect meal for breakfast or lunch. Grab a toasted everything bagel and load it up with vegetables and cream cheese for the ideal compliment to your cup of joe.